When you like having people ask you where you got that sharp looking suit or who makes that sharp looking suit, EJ Samuel is the brand for You. 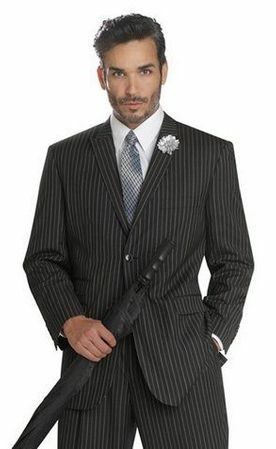 This rich looking black stripe 3 piece suit features a stripe color fabric that really stands out. The jacket is classy 2 button style with the paisley pattern vest and single pleat baggy pants all made of Wool feel poly/rayon fabric.